Populations of both sun and sloth bears have been in steady decline across Southern and Southeast Asia, and are recognized as highly endangered under CITES and by the IUCN/SSC Bear Specialist Group. Accordingly, community-level conservation education addressing coexistence with and conservation of these bear species is critical to their future survival. Currently, the Conservation Breeding Specialist Group-South Asia (CBSG) based in India and the WildAid Kouprey Express Program in Cambodia are working on the ground to implement fundamental wildlife conservation education efforts. This in-situ project facilitated by the EWCL Education and Outreach Team, via the Philadelphia Zoo, created priority sun and sloth bear educational materials (posters) to supplement existing conservation programs in the region, supporting targeted bear conservation awareness in communities where it is limited or nonexistent. 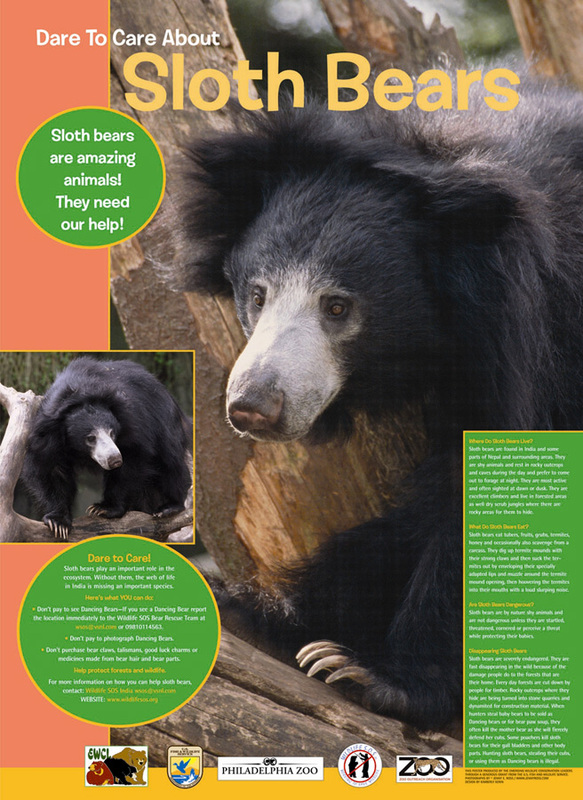 Together with our partners two Southeast Asian bear conservation posters were created; one sloth bear poster in English and Hindi for Indian partners and one sun bear conservation in English and Khmer for Cambodian partners (see English versions attached). 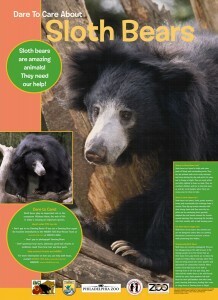 In India, 5,000 full-sized sloth bear posters (2,500 in Hindi and 2,500 in English) were created and distributed during the country’s national Wildlife Week to more than 65 conservation education organizations including forest divisions, zoological partners, education institutes, schools and universities, reaching more than 10,000 community members in their conservation awareness programs (see attached distribution table). A total of 400 full-sized and 50,000 flyer-sized sun bear posters in Khmer will be distributed to schools and communities in Cambodia. 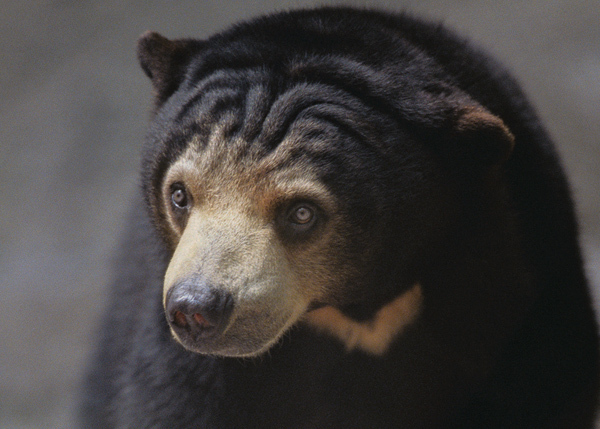 It is anticipated that the “Dare to Care” sun bear conservation awareness campaign will reach 50,000 community members and close to 10,000 school children. Testimonials and photos from several secondary partners are attached. These testimonials serve as part of an informal evaluation of the project, measuring the impact of the posters on bear conservation awareness. As a result of our partnership, field partners in India and Cambodia will be able to view and when necessary reproduce (reprint) a high quality conservation education resource in the future. 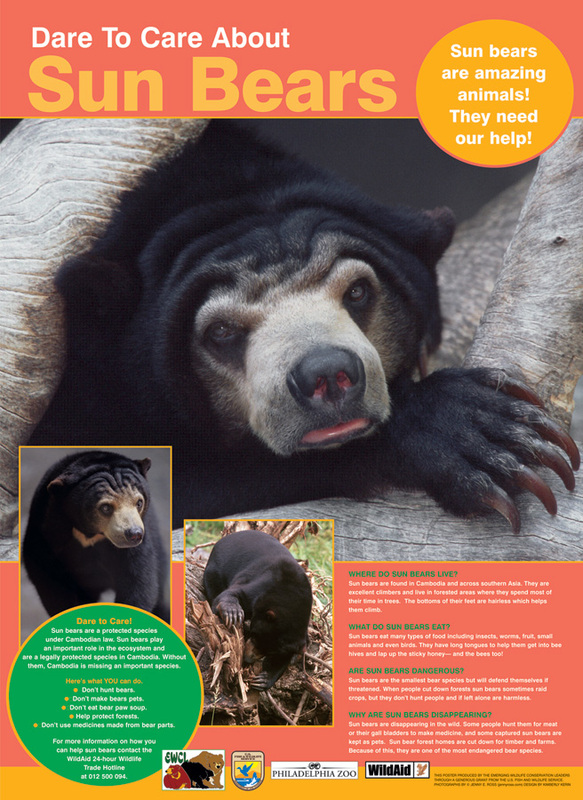 For example, the Kouprey Express Program in Cambodia will be mounting over 400 posters in schools throughout the country which will be a continuous reminder of sun bear conservation awareness for years to come. Also, because printing was the least expensive of the project costs, our partners have indicated that they will be able to use the English text for translation into other languages. This text could be shared with additional regional partners living in countries where one or both bear species are threaten for additional translation and production for local, national or international conservation awareness programs or events. Our CBSG partners have already indicated that a full-time bear awareness educator was recently been hired at the Agra Bear Center in India. In addition to the wide range of audiences reached through the Wildlife Week, 1,500 sloth bear posters have been sent to the Center. Distribution of posters at the Agra Bear Center will be very powerful since this rehabilitation and rescue facility educates visitors on the firsthand realities of using bears as entertainment; visitors see bears with nose scars from the rings where they put the ropes, burn scars from their “training”, etc.